Beyond the Broken Church is a collection of heartfelt learnings from Sarah Cunningham, a young adult raised in the faith, about the church she's not always sure she wants to be part of. The book engages concerns of a disillusioned generation head on and offers hope and honest, practical ideas for moving beyond one's frustrations. In the end Beyond the Broken Church tells a story that will be familiar to many: the journey of overcoming disillusionment and staying the course. This revised and expanded version of the popular book Dear Church revisits the existing book with additional chapters, fresh statistics, new insights into why people are leaving the church, and a resource guide for those who care about the disillusioned and want to understand them better. 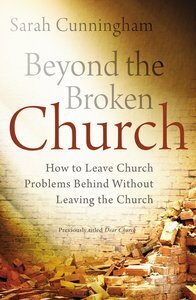 Beyond the Broken Church will be a breath of fresh air to others who have experienced frustration in church as well as an insider's guide for those seeking to understand current trends in church attendance, particularly among the younger generation. About "Beyond the Broken Church"